Shepherds Pie is a meat pie dating back to the Middle Ages. Traditionally “Mutton Pie” was made using lamb or mutton and vegetables baked in a thick pastry shell called a “coffyn”. The pastry was thick, tough and inedible. The “coffyn” was a type of baking dish patterned after the stoneware dishes of Ancient Egypt that could withstand hours of heat. 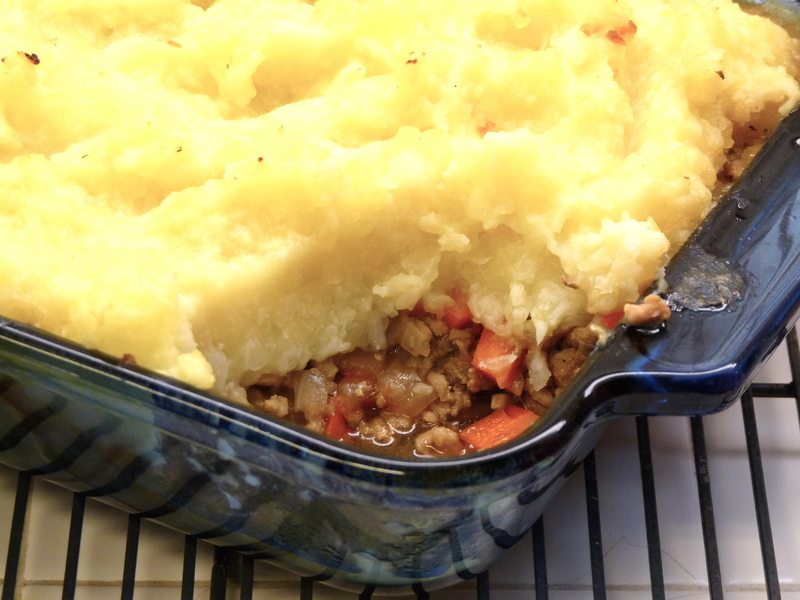 The “Cottage Pie” is believed to have originated in Scotland. The cottage pie was traditionally made with beef and vegetables topped with mashed potatoes unlike the shepherds pie made with mutton and vegetables. Pies or casseroles were a useful way to use left over meat. The vegetables consisted of what ever was available that season. The Elizabethans favored a similar “Minced Meat Pie” seasoned with cloves, mace, pepper, saffron, raisins and prunes. Cottage pie came across the seas to the America’s with the English. There are as many versions of Shepherds or Cottage pie as there are Grandmothers. This recipe for Cottage Pie is a mixture of beef with gravy and loaded with veggies. In a large nonstick skillet cook the meat over medium heat, stirring occasionally, until brown, about 5 minutes. Transfer the meat to a plate. Drain any fat remaining in the skillet. Heat the oil in the skillet over a medium heat. Add the onions and carrots and cook, covered, until the vegetables begin to soften, about 8 minutes. Raise the heat to moderately-high. Add the mushrooms and thyme and cook, uncovered and stirring occasionally, until the mushrooms are soft and their liquid has evaporated, about 8 minutes longer. Return the meat to the pan. Add the flour and cook, stirring, for 2 minutes. Stir in the broth, 1/2 teaspoon of the salt and 1/8 teaspoon of pepper and bring to a simmer being sure to scrape up any brown bits from the bottom of the pan. Stir in the peas. Pour the mixture into a 12-cup shallow baking dish (about 11 by 9 inches). Preheat the oven to 350 degrees F. Scrub the potatoes and cut into 2-inch pieces. Arrange the potatoes in a steamer basket, and steam for 10 minutes. Add the cauliflower to the basket and cook until the potatoes and cauliflower are tender when pierced with the tip of a knife, about 15 minutes longer. Mash the vegetables with a potato masher until smooth. Heat the milk, butter, the remaining 1/2 teaspoon of salt and a pinch of pepper and stir into the potato mixture. Spread the potato mixture on top of the meat and bake until heated through, about 25 minutes. — For a smaller serving bake individual cups using 6-oz ramekins per person; or use half the mixture and bake in a 9X9-inch pan. – Use the leftover potatoes with another main dish later in the week. – Use the leftover meat mixture in a pot pie. Grease a pie plate with oil or butter. Lay 1 pie crust in the bottom then fill with meat mixture. Top with another layer of pie crust. Freeze or use within the next two days. – Make a Mexican pie. Add a tablespoon chili powder, 2 tsp cumin, black beans and corn. Layer in a cake pan: tortilla, mixture, cheese. Repeat. Freeze or use within the next two days. so glad you told the difference between the two. It’s a touchy subjuect to some if you call a beef pie shepards pie!